This quick-and-easy side dish requires just a few minutes of prep. 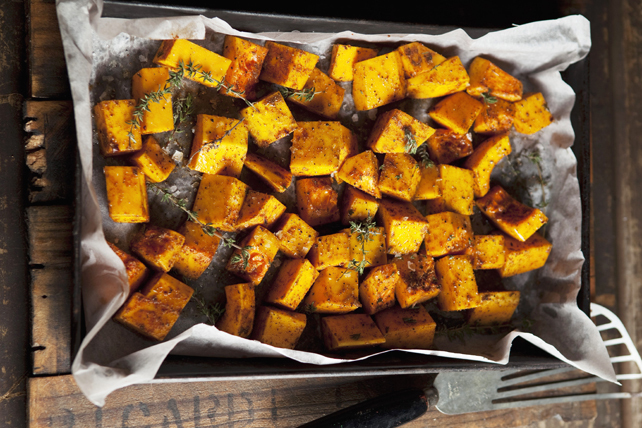 Try our Oven-Roasted Sweet Potatoes with Thyme recipe for a delicious side dish your guests are sure to love! Toss potatoes and thyme with dressing. Spread onto parchment-covered rimmed baking sheet. Bake 25 to 30 min. or until potatoes tender and golden brown, turning after 15 min. For more flavour, mix 1/4 tsp. cayenne pepper with the dressing before tossing with the potatoes and thyme.